There are many reasons why you might want to record your screen rather than take a screenshot. Sometimes a still image of a Windows app isn’t enough and what you really want is a video showing the on-screen action. A screenshot is the equivalent of a photo, but recording a video your screen can better help to explain to someone how to fix a problem when you’re offering technical support, or you might want to make videos for YouTube. You might want to record a gaming session and share it with friends, or something else entirely. Camtasia is a powerful screen recorder tool that makes it easy to record what’s happening on your PC, convert the results into a polished presentation, then share it with the world. As well as recording applications, you can also use it to record games. If you make tutorials, you can highlight the mouse pointer and clicks, as well as easily zooming into an area of the screen to make it easier to follow what you’re doing. Bandicam is an easy-to-use recorder capable of capturing a specific area or the full screen. It lets you easily record flash games, streaming videos and more. The software offers several modes like gaming mode, screen recording mode and device recording mode for perfect recording. Icecream Screen Recorder can record the entire computer screen or specific parts of the screen. With the software, you can record video calls or conferences, game plays, etc. via its intuitive and user-friendly interface. You can draw on screen as you record, too. SnagIt 13 is a big update on previous versions of the screen capture software. It’s made by the same company as Camtasia, and even though it’s primarily a screenshot tool, it can now record and edit video. 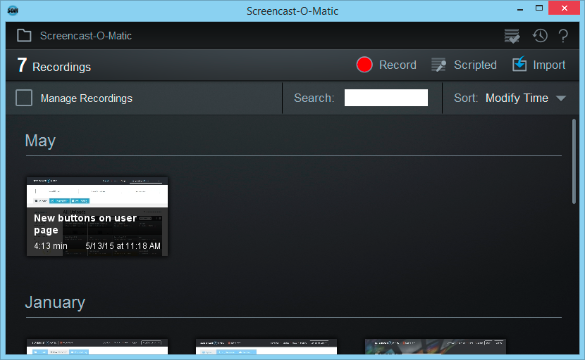 Screencast-O-Matic records your computer’s audio and video and lets you edit the area of your screen that you want to record. With the free version you can only record 15 minutes of video, and sticks a Screen-O-Matic watermark on your videos. You can publish your videos in MP4, AVI and FLV formats as well as automatically upload them to YouTube.